© Rip and crosscut work pieces for the tray sides and ends, according to the dimensions given in the Cutting List, page 214. 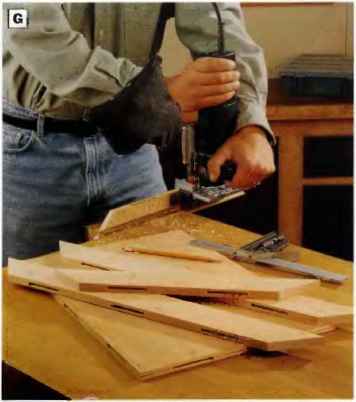 PHOTO A: Lay out the finger joints or the emis of the tray side and end pieces. Use a combination square to mark the Joints. Draw X's on the waste areas. PHOTO B: Mill the finger joints with a Vz-in.-wide dado blade. 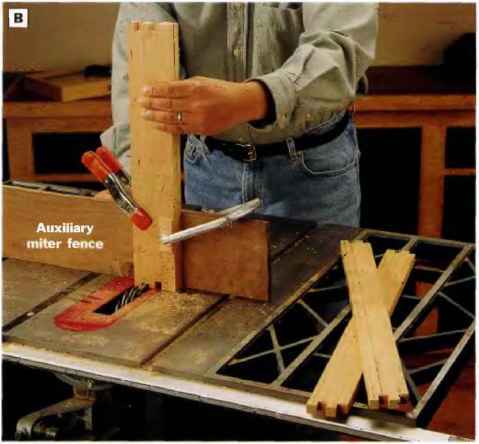 Attach an auxiliary wood fence to the miter gauge to hold the workpieces securely. Since the fingers match on iike workpieces, damp them in pairs to cut the fingers in both parts at once. Note: Work carefully when setting up these ciifs-eren slightly misaligned cuts can produce poorly fitting finger joints. © Mark the tray ends for the handles and finger joints. Start by drawing a 1 x 1-in. 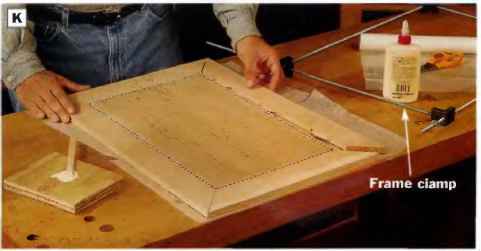 grid pattern on the tray ends, then transfer the curved handle profile and cutout shown in the Front View Tray Ends drawing, page 215, onto the parts. Next, lay out the finger joints. Mark Vl x Vz-in. 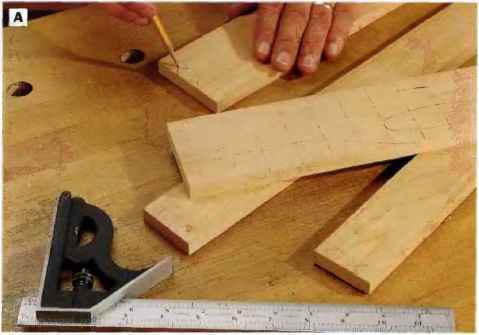 finger joints on the tray ends and sides (See Photo A). Notice on the exploded view drawing (page 215) that the lingers on the tray sides match, and the fingers on the tray ends match. In order to interlock, the fingers start on the top edges of the tray sides and on the bottom edges of the tray ends. © Lay out the bottom gr ooves. The plywood bottom will fit into i£-in.-wide, U-in.-deep dadoes cut into both the tray sides and ends. Lay out these dado cuts on the inside faces of the tray parts, H in. up from the bottom edges. The grooves on both sets of parts must stop U in. from the ends of the workpieces, or you'll cut through the closest fingers. PHOTO 0: Cut the curved handle proRies and cutouts on the scroii saw. Ybu'ii need to drili an access hole for the biade first, in order to start the handle cutout. photo F: Laminate two V4-ln. plywood sheets together to form the bottom panel. 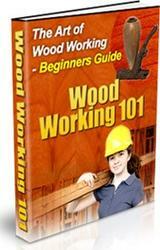 Ciamp up the piywood on both sides with iong wood cauls to press the sheets tightly together untii the glue dries. PHOTO E: Rip and crosscut the frame end and side pieces to size, then mlter-cut the ends of the parts to 45°. PHOTO C: Cut the bottom panel grooves In the tray sides and ends or the router tahie. When cutting these stopped dadoes on the tray sides and ends, mark the ieading and trailing edges of the bit on the router fence so you know where to start and stop the cuts. checking to be sure they are square to the saw table. Cut away the waste between the fingers. Follow the same procedure for cutting the tray end fingers (See Photo B). 0 Rout grooves for the bottom panel. 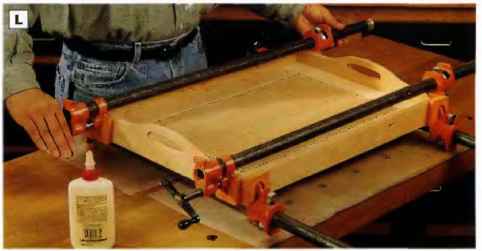 Install a Vi-m. straight bit in the router table, and align the bit and fence to follow your bottom dado layout lines on the tray sides and ends. 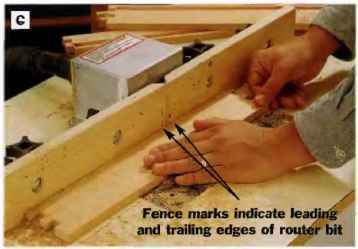 Then mark the leading and trailing edges of the router bit on the fence, and use these references to start and stop the dadoes as you cut them in the tray parts (See Photo C). Square the ends of these stopped dadoes with a chisel. 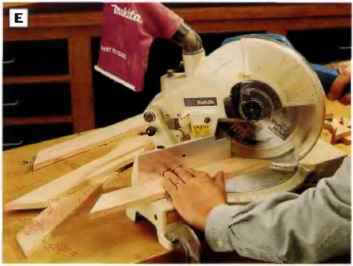 © Cut the handle profiles and cutouts on the tray end pieces with a scroll saw (Set; Photo D). © Sand the tray side and end pieces smooth. A drum sander works well for sanding the profiles. © Rip and crosscut the frame side and end pieces to width and length. 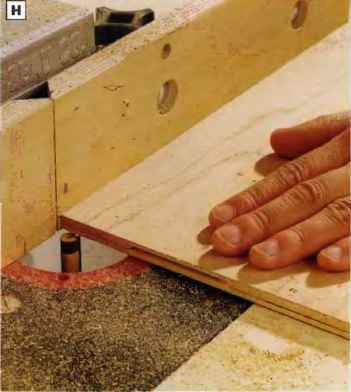 Cut 45° miters on the ends of these four parts with a miter saw (See Photo E). © Cut and glue the plywood bottom panels together to create a ^¡-in.-thick blank. Spread glue on one face of each panel, and laminate them together. 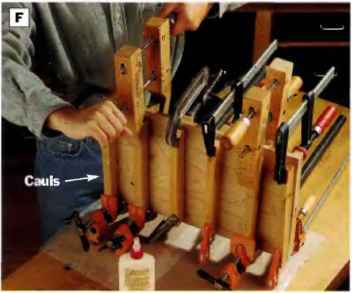 Sandwich the glue-up between clamps and long cauls to distribute clamping pressure evenly and produce a tight glue joint (See Photo F). PHOTO G: Lay out and cut #20 biscuit slots to join tbe frame side and end pieces to the bottom panei. 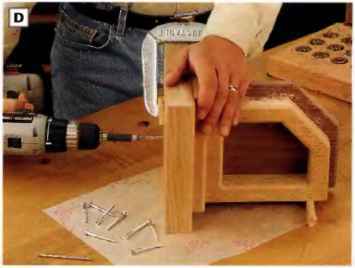 Ciamp the parts in a bench vise to hoid them securely when you cut the slots. PHOTO I: Miter-cut the corners of the decorative iniay strips using the 45° fence on a combination square and a sharp utility knife. Hoid the knife as square to the iniay as you can when making the cuts, so the mitered joints will meet flush. PHOTO J: instaii the iniay strips on the bottom panel rabbets. Glue one piece at a time to the plywood, and press it firmiy In piace with a coupie of ciamps and a wood caui. Cover the inlay with wax paper before clamping on the caui to keep the parts from sticking together. Photo G). Plan for two biscuits on each end piece and three per side piece. Cut all the slots. © Rout, a VMn.-witle, kte-in.-deep rabbet around the top face of the bottom panel for the decorative veneer inlay strips. Use a straight bit in fiie router table to make these cuts (See Photo II). © Cut and fit the bottom panel inlay strips. Instead of cutting these strips all at once, you'll get better results if you work your way around the bottom panel, cutting one piece at a time, then fitting and cutting the adjacent strip. 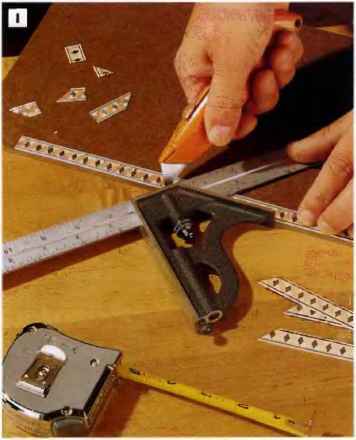 Trim 45° miters on the ends of the inlay strips with a sharp utility knife and a combination square (See Photo I). For best visual effect, try to cut the corner joints so the inlay pattern continues around the coiners without abrupt breaks in the pattern. Note: Most decorative inlay strips have a pattern repeat for seaming and cornering. 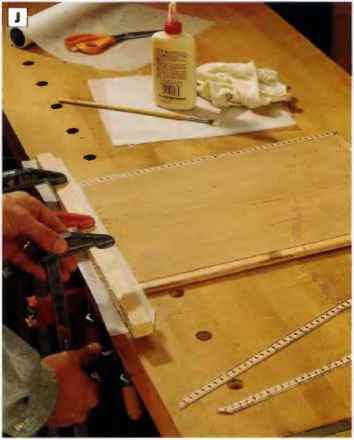 © Glue the inlay strips to the bottom panel: Install the pieces one at a time in the shallow rabbets. Clamp the inlay in place with a wood caul protected by wax paper, in case the glue seeps through the inlay. Allow the glue to dry before removing the caul and moving on to the next strip (See Photo J). (J) Install the frame sjrio and end pieces on the bottom panel: Spread glue on the mating surfaces of the part s and into the biscuit slots. Insert the biscuits and clamp up the assembly (Set; Photo K), A frame clamp or strap clamp works well for holding the mitered comers closed while the glue dries. Then sand the bottom assembly smooth. PHOTO K: Attach the frame sides and ends to the Inlaid bottom panel with glue and biscuits. Dry-fit the parts together first with the biscuits in piace. Once the pieces are glued and fitted, install a frame damp around the assembly and tighten. 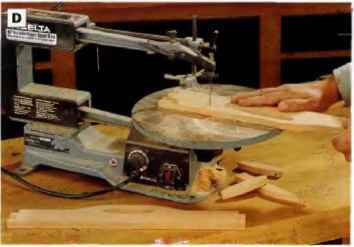 PHOTO L Spread glue onto mating surfaces of the finger Joints, slip Hie bottom into Its grooves and damp up the tray, install damps both lengthwise and widthwise to hold the finger joints closed in two directions. © Dry-fit the tray sides and ends around the bottom panel assembly with the bottom panel inserted in its grooves. Then disassemble the parts, spread glue in the gaps between the fingers, and fit the tray together (Sc« Photo Ij). Do not glue the bottom panel into its grooves sn it can "float" freely. Clamp up the tray both lengthwise and widthwise, and measure diagonally from corner to corner to be sure the tray is square. Adjust the clamps to make corrections. © Smooth the entire project with 220-grit paper, easing all the edges lightly as you go. Apply three coats of'clear tung oil to the tray. Sand between coats with 320-grit wet/dry paper or #0000 steel wool, arid remove the dust with a tack cloth. If your tray will be used to serve beverages, topcoat with three layers of polyurethane varnish instead of tung oil, to protect it from moisture stains. 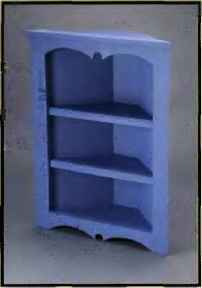 Turn an unused corner of your kitchen or dining room into a display area with this reproduction of a Colonial-style corner cupboard. 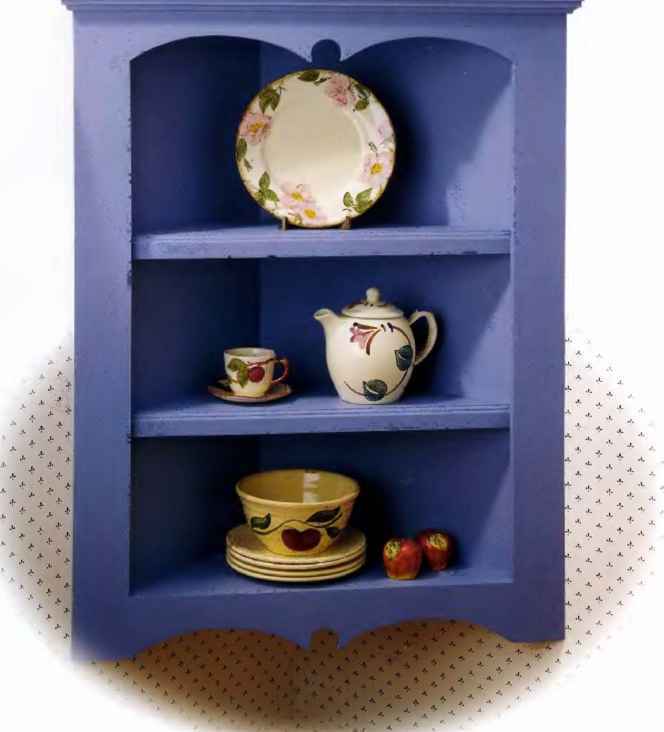 Made from dimensional pine, our cupboard features a contoured face frame, three open shelf areas for display purposes and hangs on the walls by way of hidden French cleats.